Join Us for the 2019-20 Season. We invite you to get the most out of your Mondavi Center experience by joining us as a subscriber. Not only will you enjoy significant savings by purchasing a package of shows in advance, you will also gain access to valuable benefits throughout the season. Explore your options online or view the downloadable Season Brochure. 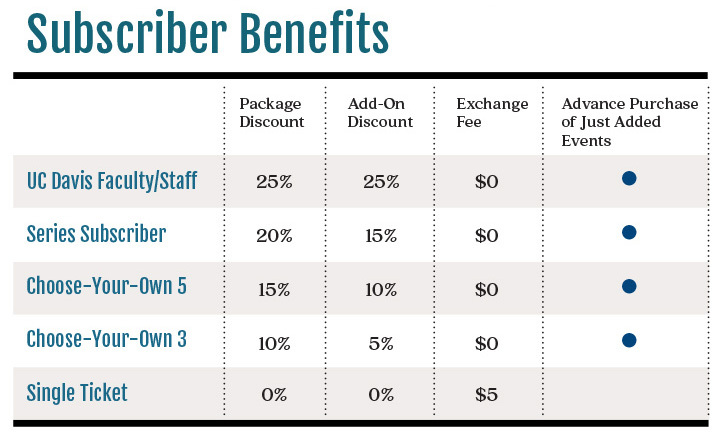 - Subscription RENEWALS begin April 8. - NEW subscriptions go on sale June 3. - SINGLE tickets go on sale July 15. Visit the Mondavi Center Ticket Office and talk with a ticket agent. CYO 5 — Choose 5 or more events and save 15% on your package + 10% discount on any additional shows purchased throughout the 2018–19 season. CYO 3 — Choose 3-4 events and save 10% on your package + 5% discount on any additional shows purchased throughout the 2018–19 season. *UC Davis Faculty & Staff: Your discount will be 25%, for all purchases, regardless of subscription type.